On the day of her wedding, Margie, a young bride, shuts herself up in her mother's bedroom and declares that she won’t get married. Her family gathers at the locked door, not knowing what to do. Her mother, Nadia, has lost a younger daughter in circumstances that are not clear. Her grandmother, who is hard of hearing, seems to understand her better than anyone. Ilan, a cousin who likes to wear women’s clothes and jewelry, clings to his grandmother like a little boy. And then there is Matti, the despairing groom, trying to decipher his beloved’s silence and understand why she refuses to marry him. The problem is not solved by the arrival of the groom’s parents and a psychologist who specializes in brides that change their mind. The harder they all try to reach defiant Margie, including bringing a high ladder belonging to the Palestinian Authority Power Company, the more Matti empathizes with her, and the more convinced he is that her refusal should be respected. But does that mean that she doesn’t love him? Perhaps she is actually rejecting social and family demands, a sort of female rebellion against the role that the world expects her to play. A thought-provoking and enjoyable novella that will stay with the reader long after s/he has finished reading it. COMPLETE ENGLISH TRANSLATION AVAILABLE (for publishers only). A spellbinding novella … The action is replete with human gestures and behaviors that are delicately drawn … A fable on the Israeli condition … Matalon is one of today’s best Israeli authors, one of the original, intriguing and unique voices now active here. Her writing – the themes, the characters, the way they are shaped – is distinct and unique. A dazzling novella … A novella that is impossible to put down, right up to the last moment … This is exactly the way literature should be written. A great story … Ronit Matalon’s prose seems to flow… Elaborate, masterful narrative by one of the finest Hebrew writers, which does not forgo a rational structure, but is totally under her control within the volatile and vivid emotional current. If there is a narrative essence that Israeli literature, drama and cinema love to keep on going back to, Ronit Matalon’s new book formulates it in a firm and concentrated manner … Matalon, certainly since the early 2000s, has been establishing herself as an authoritative and influential author. Critics treat her work with the respect that once was reserved for Yehoshua, Oz and Grossman … It seems that today she is the prime, outstanding example, among both male and female writers, of the persona of the intellectual author who turns to the public at large on behalf of the important, big story … Matalon is a specialist at exposing the secrets and the flaws of her characters. Under a light veil, great drama takes place, touching upon ethnic tensions, racism and the covert war between men and woman… Not many books can offer what Matalon’s book offers, a literary experience that is both very enjoyable and very shocking. A marvelous book. .. A brief but abundantly endowed novella. What makes And the Bride Closed the Door such a searing and entertaining novella is the talent for extracting the unusual from the everyday, the specific from the general … Matalon is known to have a remarkable ability to express the feelings of her characters down to the finest of nuances … And the Bride Closed the Door is a book with its feet on the ground. One outcome of this is the marvelous metaphors – funny, precise and caustic – that are scattered throughout, and that emanate from a protracted observation of the characters … And the Bride Closed the Door is among her best works. It is precisely because everything, starting with the theme and ending with the main points of the plot, are so familiar and almost ordinary and self-evident for a movie or a story, it is impossible not to be impressed by the way Matalon has chosen to take this subject and use it to weave a refreshing magic cloth, full of unexpected components, shades and tints, accurate observations of people and reconstruction of the way they move, speak and interrelate. 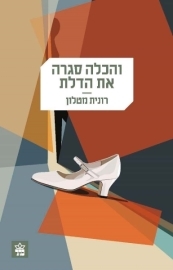 Matalon’s discernment is amazing, as are the descriptions of the small details and the most insignificant events from which life is made … And the Bride Closed the Door is a beautiful novella, elegant, sophisticated and meticulous. A novella written with impressive literary skill … Martalon’s prose is elegant, effortless, without a trace of forced artificiality.